If space is of a premium, then the Panasonic NN-K155W could be an ideal microwave for you. Be warned, it is very small - with only a 17 litre capacity - and so you may struggle to get larger plates to fit inside. It takes up very little kitchen space, with overall dimensions of 45.5cm by 32.5cm by 26.0cm, and a weight of 11.5kg. 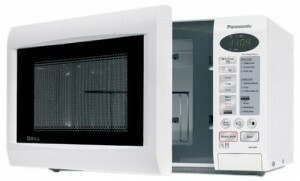 Essentially this is a very small white grill microwave - probably the smallest we've come across - if you're looking for a compact yet reliable Panasonic microwave, then this is well worth considering. The controls are simple to use, and overall build quality is very good. The LED display is very easy to read, and operating the microwave was a simple procedure. 6 Different auto reheat and cook programs are included, as well as 5 Different Power levels when in microwave mode, and 3 different grill modes. Our testers liked this model - however it may be a little too small for larger families - so bear this in mind before purchasing. If you have a small kitchen, and need a reliable grill microwave to suit, then this model is well worth looking at. A very high specification microwave packed into a compact size - the Panasonic NN-K155W is very well built, works well, and takes up very little room. It may not cater for larger plates, but will be ideal for smaller households / kitchens. In what order are the dimensions foe Microwaves ? Please could you send me a manual as I can’t seem to get one through normal channels. My mother has used this oven for some time quite happily, but she now has Alzheimer’s so needs the manual to remind her. Thank you.